Jackson stresses that his book is not a complete biography of CCR5, as the gene’s story is still very much unfolding. Just last year, for example, researchers elucidated the structure of the complex that the CCR5 protein forms when CCL5, an inflammatory cytokine, binds to it, paving the way for designing novel CCR5-targeted AIDS drugs. Through the lens of a relatively short gene buried within the human genome, Myles dissects the scientific, industrial, and sociological forces that have shaped the genomic research enterprise over the past 20 years. Renowned neurologist and prolific writer Oliver Sacks has always injected his own experiences and emotions into his gripping tales of disease and brain science. But now he has penned the most personal work of his long and distinguished career. 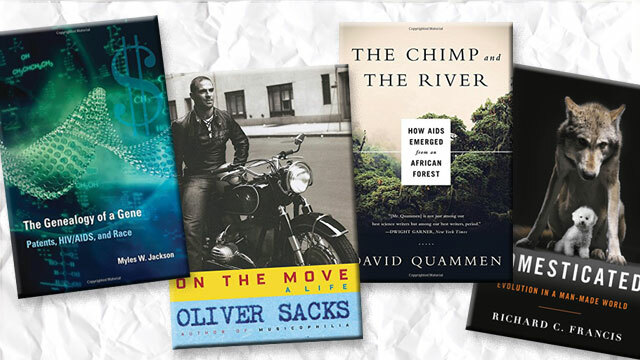 In his autobiography, On the Move, Sacks leaves no stone unturned as he delves into all points—pleasurable, painful, and otherwise—of his life. From his boyhood fixation on motorcycles, to the clinical experiences with encephalitis lethargica that inspired his first major book, 1973’s Awakenings, to love affairs, struggles with drug addiction, and his bond with his schizophrenic brother, Sacks offers an intimate look at the defining moments of his journey thus far. Sacks’s autobiography comes at another crucial crossroads in the 81-year-old author’s life. He revealed in a February New York Times opinion piece that the cancer detected in his eye nine years ago has metastasized to his liver. He relates the fear and gratitude he feels as he stares death in the face. If ever there was a time to get to know Sacks, especially through the intimate self-portrait he paints in On the Move, it is now. Seasoned science writer David Quammen brings his unparalleled knack for prose to the seldom-told, or at least oft-misunderstood, ecological origin story of the HIV/AIDS epidemic. In The Chimp and the River—extracted from his 2012 best-seller Spillover, updated and with new material added—Quammen deftly reconstructs the epidemic’s zoonotic origin, which likely involved a single human contracting the pandemic group M type of HIV-1 from a chimp he butchered in southeastern Cameroon around 1908. As ever, the author places himself in the action, travelling to remote corners of Africa and infectious disease labs across the world. Domestication has brought humankind into close proximity with erstwhile wild animals that for millennia have provided us with companionship, food, protection, hunting help, and fibers. But how we tamed free-living creatures to the point that they became amenable to confinement, servitude, and/or snuggling is largely lost to history. Science journalist Richard Francis, who also has a PhD in neurobiology, draws on a variety of scientific disciplines to construct case studies for a number of different species in Domesticated: Evolution in a Man-Made World.